A Bit Backward . . .: Fresh Papaya Smoothies - Yum! Fresh Papaya Smoothies - Yum! When purchasing our fresh produce for the week, Squire suggested we get a papaya. Since I had never actually eaten fresh papaya before, I decided that 23 years of waiting was long enough. So Squire picked out a big one, and we brought it home. We were both a little grossed out by the seeds inside which resembled fish eggs. (Caviar: yeah, I'm pretty sure you couldn't pay me to eat it, let alone charge me $690 for 4.5oz. tin of the stuff.) The fruit was a pretty orangey-pink and had a very sweet, honey-like, tropical flavor. We liked it alright, but we both agreed it probably wouldn't be something we would want to snack on plain. I suggested we try it in a smoothie. So Squire cut up the rest of the papaya and put it in our freezer for the night. 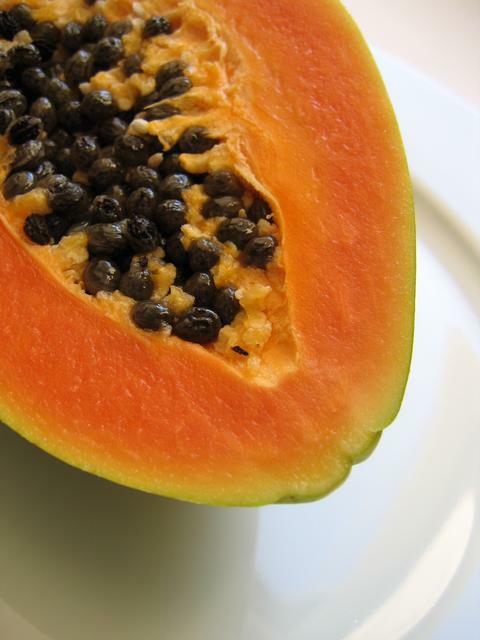 This first time experience with fresh papaya won't be our last!